The University of Washington chose the UW Bothell campus Science and Academic Building to pilot an improved approach to temporary construction site lighting. A review of existing UW construction site lighting practices resulted in the following objectives: dramatically increase light levels; eliminate the risk of electrical shock and burns; minimize energy consumption; reduce lamp reconfiguration and replacement maintenance; and maximize environmental accountability. UW’s existing temporary construction lighting system was line voltage powered and illuminated by bare 13-watt compact fluorescent and 400-watt metal halide lamps. The “old technology” approach created safety and sustainability challenges. The “bare lamp” system produced poor lighting (inadequate light levels, low uniformity, disabling direct glare) and did not meet the 5-footcandle OSHA requirement. The line voltage system created an on-going risk of electrical shock, fire and burns. There was also high operational/maintenance costs related to excessive power consumption, continual lamp replacement, and on-going lamp reconfiguration. Additionally, the compact fluorescent and metal halide lamps produced UV radiation and contained mercury and other toxic heavy metals. Damaged and broken lamps posed a constant risk of worker exposure to toxic vapors and dangerous UV radiation. There was also a financial challenge. Traditionally, the contractor purchased the equipment and was responsible for reconfiguration and maintenance but the university paid for energy. The University and the electrical contractor needed to negotiate a fair division of the burden and benefits of a more expensive system. The UW Capital Project Office selected Clear-Vu Lighting’s FLEX SLS low-voltage LED lighting system for this project. FLEX surpassed federal (OSHA) minimum mandated light levels and eliminated the risks of electrical shock and exposure to toxic vapors and UV radiation. Additionally, this new system would reduce costs over time, improve worker productivity/task performance, and employ reusable products in an environmentally responsible way. A combination of 50,000 hour LED lamp life and robust lighting fixture construction (impact resistant and submersible) would eliminate lamp replacement costs. Careful pre-planning by the electrical contractor eliminated reconfiguration costs. 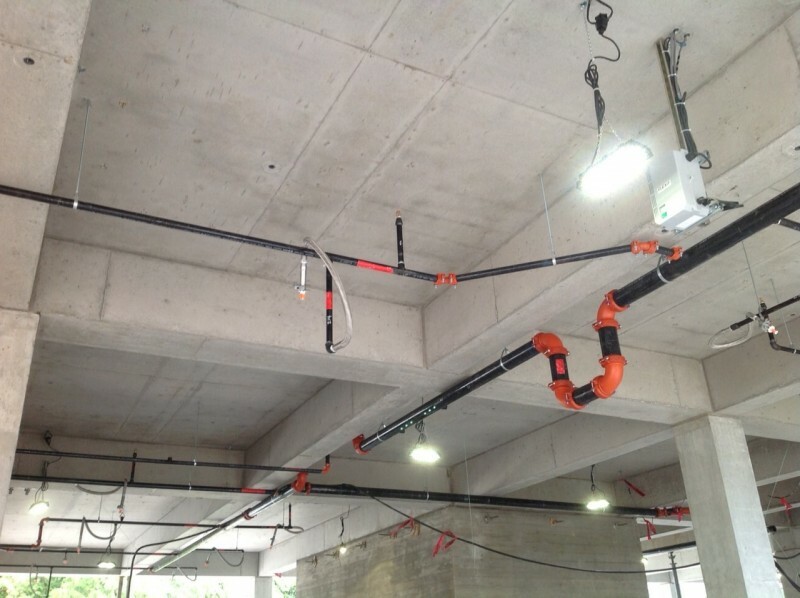 Nelson Electric identified fixture locations that would not interfere with on-going construction and used Clear-Vu Lighting’s patented concrete deck box system to bury the low-voltage power cable in the concrete slab. The FLEX SLS LED lighting system produced high levels of uniform, glare-free light, used 89% less energy and eliminated lighting reconfiguration and lamp replacement maintenance. The FLEX SLS system, with a life expectancy of 10 years, paid for itself in 11.5 months. In addition, FLEX’s 50,000 hour LED lamp life (10-year product life expectancy) eliminated the disposal of the thousands of CFL and metal halide lamps. Everyone benefited from this cost effective, safe and environmentally responsible choice. The University, the general contractor and electrical contractor shared the monetary benefits of low energy consumption, zero lamp replacement maintenance and the elimination of lighting fixture reconfiguration. The workers benefited from the safety and ergonomic benefits of high levels of glare-free, uniform light. The environment benefited from a reusable lighting system free of dangerous mercury and broken glass. True sustainability considers profit, people and the planet.